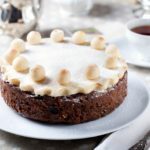 Simnel cake is a light fruitcake, covered in marzipan, then toasted. Eating of the cake signifies the end of Lent so it is rich with the butter, eggs and milk which were restricted during Lent. It is also the traditional Mothering Day dish. Making your own almond paste is much better than store bought which tends to have too much sugar and which may liquefy under the broiler. To make your own almond paste you will need a food processor fitted with a steel blade. Process the icing sugar and ground almonds, slowly dripping in egg yolk, orange juice and almond essence. The mixture should form a pliable paste. Set aside a small portion for 11 balls to decorate the cake. Roll out the remaining paste into 2 circles which are the approximate size of your baking pan. You can use the bottom of the pan to trace an outline and cut inside the line to ensure a good fit. Preheat oven to 325°F. Prepare a 9 inch spring form pan, by lightly greasing the bottom and sides. Sift flour, salt and spices together, then stir in fruit and peel. Cream butter and sugar thoroughly until light and creamy, then beat in eggs one at a time, until the mixture is fluffy. Reserve a teaspoon of egg for finishing the cake later. Gently stir flour and fruit into the creamed mixture in two stages, adding a little more milk to give the mixture a dropping consistency. Place half the mixture into the prepared pan. Place one pre-rolled round of almond paste on top. Cover with remaining cake mixture. Before baking the cake, give the pan a few sharp taps on a firm surface. This settles the mixture and prevents holes from forming in the cake. Place the pan on a baking sheet. To prevent the cake from drying out, wrap corrugated cardboard — extending about an inch above the pan — and secure it with twine. Bake in the centre of the oven for 1 hour. Lower the heat to 300°F and bake for an additional 3 hours or until a thin metal skewer inserted in the centre of the cake comes out clean. Level the cake by placing a heavy pot on top of the cooked cake while it is still hot. When the cake has cooled slightly, remove the pot and the cardboard, and place the cake on a wire rack, allowing to cool completely in the pan. Brush the top of the cake with apricot jam which has been warmed, then cover the top of the cake with the second round of almond paste. Roll 11 small balls of retained paste and place evenly around the edges on top of the cake. Brush the top with a little beaten egg and very lightly brown under the grill until the almond paste turns light golden brown. Remove and leave to cool. You can now release the clip on the spring form pan. I like it plain, but many people also decorate with a ribbon tied around the base, particularly for Mothering Day, and a few edible flowers placed on the top.